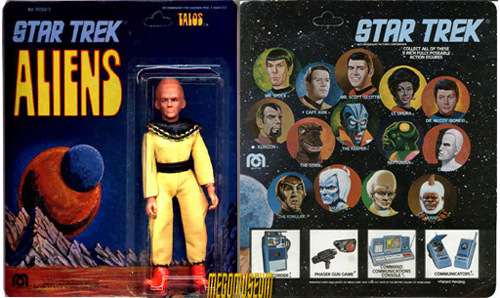 Mego Talos (Item No. 51204/2), not even the name is correct. (The planet was called Talos IV, but the indigenous people are generally referred to as Talosians.) Technically he should have been called "The Keeper" as he was reffered to in the pilot episode. The head sculpt was surprisingly accurate, with excellent vein detailing on the bulbous, oversized Talosian noggin; the kudos end there, unfortunately. Although the Talosians are depicted as somewhat frail and physically weak in "The Cage," they are not diminutive enough to warrant the use of a Teen Titans six-inch body for their Mego representation. As if this were not enough, Mego chose to forego the flowing robes of the Keeper in favor of an outfit that is, in no uncertain terms, a CLOWN SUIT. 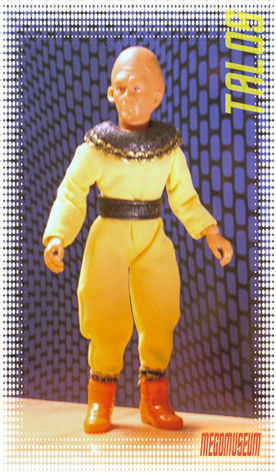 The figure comes clothed in a canary yellow jumpsuit with black/gold trim at the ankles. An oversized leatherette collar (similiar material to Mego Fonzie's jacket) is sewn to the neck, and also features black/gold trim around the edge. The leatherette material can be found in a cracked and mottled state, having lost most of its pliability over the years. Additionally, the black/gold trim of the collar is usually unraveling at the back due to poor finish sewing. Needless to say, it is extremely difficult to find a minty Talos figure outside of a sealed package. The outfit is completed with a wide black leatherette belt (which usually does not suffer the crackling effect to the degree that the collar does) and, almost as a final insult--wait for it--BRIGHT ORANGE BOOTS. Here we have an Talos on a "14-back" card, which was the only way it was available.